My rating 5+ out of 5 stars! A couple of years ago C. Kevin Thompson wrote the beginning of this series with a different publisher. The story started and ended on a cliffhanger that was beyond description as it was written so very well! Now, here is, in my opinion, an even better start to the Blake Meyer thriller series. Blake Meyer has been with the FBI for a long time and is looking forward to a desk job prior to retiring. Blake’s wife and children cannot wait either for him to come home in the evenings to spend time with them. Now a threat is looming on the horizon or is there more than one? Is there a mole in the government or more than one? How come a captured person of interest knows Blake’s name plus threatens his family? Throughout the story there are veiled antagonists and some unveiled, but who is the one who has pulled all these enemies together to come after the USA? 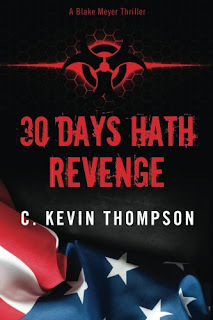 C. Kevin Thompson has written a very suspense-filled thriller that is quite believable! It took my breath away as parts kept ramping up the tension all the while I am trying to figure out who is the leader of the threat. The author does a masterful job of keeping readers glued to the pages and hearts racing. The pace of the tale is at breakneck speed and with the chapters being only a couple pages it makes the story move along while not losing the reader! The sequel is already released titled, Triple Time, with the third installment due out later this year titled, The Tide of Times! Grab these books and get caught up in the story before any more of the Blake Meyers are released as you will certainly enjoy them! If you know anyone who loves a good story with heart-pounding action, tell them of the Blake Meyers Series by C. Kevin Thompson! Review of "True to You"